There’s a new crane in town and it’s making lifting heavy objects great again! 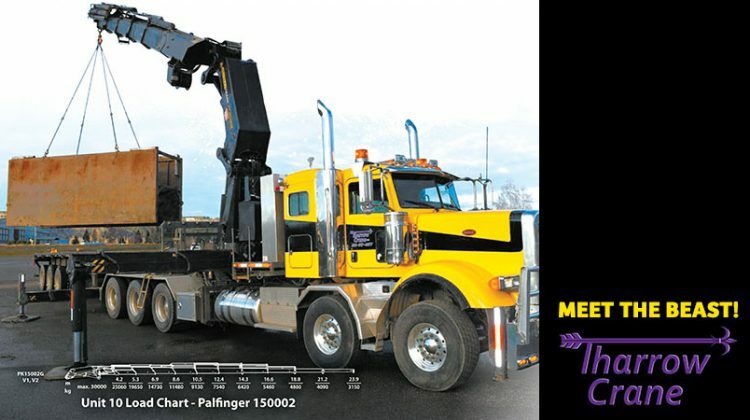 Tharrow Crane has acquired the largest Knuckle Boom Crane in the Central Interior, the Palfinger PK 150002, a.k.a. “The Beast”. Cranes have become common on any work sight that involves heavy lifting or the lifting of materials onto higher areas. They are an indispensable asset to the construction and engineering fields. Many types of cranes can quickly and easily move equipment into trenches or down steep hills. They can move large pipes from one place to another, and are beneficial in the construction process for buildings, bridges and overpasses. With a company like Tharrow Crane at your disposal, it is unlikely you’ll have to decide which type of crane to use, but if you’re not sure you can call Glenn today at 250-617-4877 to discuss all your mobile crane needs. With a vast range of mobile cranes and trailer combinations along with certified operators and a knowledgeable team, Tharrow Crane Ltd can service your lifting needs or they will direct you to who can. And a live person will answer your call, never an answering service. Tharrow Crane’s newest unit, The Beast, is a truck mounted articulating crane. The PK 150002 Performance sets new standards in terms of quality, working range and lifting capacity. This large high-tech crane masters extreme tasks and maximum loads just as easily as challenging precision work. The Beast can move larger, heavier items: tools, cans, generators, pipes, power units, lathes and has a reach of just under 87 feet. No matter what, if you’ve got something heavy to move, Tharrow Crane is your best bet. They offer crane, transportation and hot shot services in BC and Alberta, and will work with you to keep crane costs down. You can find out more about The Beast and the rest of Tharrow Crane’s fleet and services at tharrowcrane.ca.